of this and that: Coming Soon!!! Kiran Manral's third novel is soon to be launched! And since most of the action takes place on a ship, "launch" seems particularly appropriate. 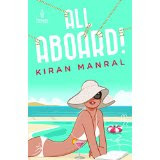 'All Aboard' is published by Penguin Random House. When Rhea Khanna is dumped just days before her marriage, by her boyfriend of four years, the only thing she wants to do is to get out of the city to clear her head. The opportunity presents itself immediately when her aunt, a retired school headmistress, invites her to accompany her on a Mediterranean cruise. Kiran Manral was a journalist before she quit to be a full time mommy. An erstwhile blogger, both her blogs were considered amongst India's top blogs and she was a Tehelka blogger columnist on gender issues. Thank you so much for this, Dipali. Sounds like fun. Though what would be more fun is to have an aunt who invites me to a Mediterranean cruise.